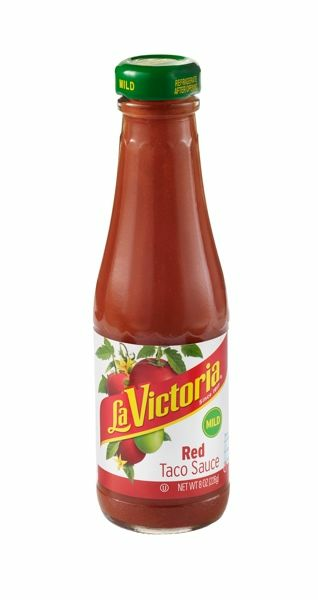 La Victoria Red Taco Sauce Mild - 8 oz. Great flavor, been enjoying it for years. It's gotten hard to find, so I was thrilled to be able to order it on-line. Very easy process, quick ship time. The sauce is not spicy, but it is flavorful. I lived in San Diego in 1960 and a Mexican introduced me to her tacos. I asked her what made them so good and she told me it was the La Victoria Red Taco Sauce. I have been making her tacos for 56 years and La Victoria is my favorite taco sauce! Now my whole family uses it, plus the friends I gave the taco recipe to over the years! Love it best taco sauce ever!!! can't get in so.texas, thank god for the computer! My family has always eaten this. There's nothing better out there. I order online whenever I live in a part of the country where stores don't carry it. THE BEST!